December 13, 2013 - 1 comment. Each year we come up with a clever paper holiday gift for our clients. Now they are available for purchase at the I Heart Denver Store at the Denver Pavilions. We’re retailing four of our most popular items. Our To Do Ta Da! Notepads offer a little daily dose of inspiration and motivation. CurliCues make gatherings more festive with a simple paper swirl that hooks around a wine stem or ribbon on a package. Make ‘em Snappy frames allow you to take the best pics off your phone and display them on to your fridge. And if getting organized is on your Ta Da list, Keep Tabs are a great start to the new year—a bank of 12 allows you to section your notebook or mark key pages in a recipe book or spicy novel. Head downtown to the I Heart Denver Store on to get a glimpse of the goods and many other unique creations from other Colorado artists. 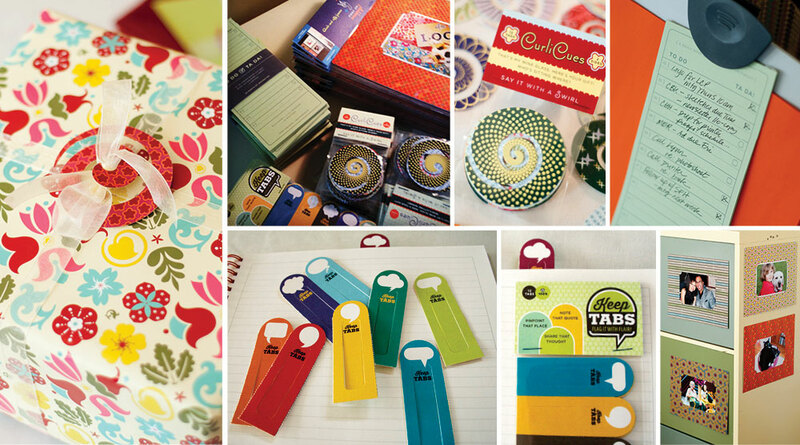 Our “hostess gifts” and a myriad of Colorado-made keepsakes are great options for far away friends and family. This locally-owned store pays 70% of the retail price directly to the artist, a rare split in the retail world. Very nice. Not sure? Maybe ask yourself: How many rounds of edits did I make last year? Uh oh. That’s ok, here’s your chance to make nice. We’re finalizing our mailing list for the next EnZed holiday gift. If you're on the list, you'll receive our next creation. Sure beats a lump of coal. Comment here or send us an email with your address to make sure you’re on the list! Photos by Lynn Clark Photography and EnZed Design. Printing by Frederic Printing and paper by Neenah Paper. Please, oh, pretty please, include me in this mailing! I used to wait for these annual materials with great anticipation, and they never disappointed. Thank you for the opportunity to see what’s in store this year!